Watco Teak Oil Review 2018 - Take Care of Your Teak & Mahogany Wood! / Watco Teak Oil Review 2018 – Take Care of Your Teak & Mahogany! Watco Teak Oil Review 2018 – Take Care of Your Teak & Mahogany! Hardwood furniture, floors and home items can be the centrepiece of any room. They give a feeling of quality and offer a traditional style that you only get from hardwood pieces. Unfortunately hardwood furnishings can be susceptible to damage over time. 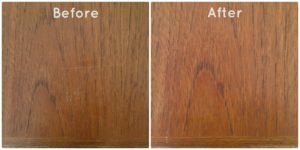 But thankfully in this Watco Teak Oil review guide you will learn how to combat this natural damage, and keep your wood looking brand new! Damage from wear and tear, dirt and staining can take their toll on your hardwood. 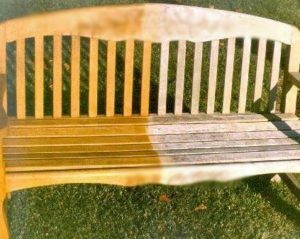 You can see a fading of the colour, noticeable marks and bleaching. This changes your the whole look of your room and home. Finishes are applied to wood to protect them from these problems. Often once a piece has been completed a finish is applied to the outside of the product. Finishes normally consist of wax, shellac, drying oil, lacquer, varnish, or paint but it varies depending on the type and brand. You can learn about wood oils here. If you’re looking to get the longest lifespan from your hardwood products you need to consider which finish to use. There are a variety on the market but WATCO Teak Oil is proving one of the most popular. Let’s take a closer look at the company and product. WATCO specialise in industrial strength flooring products. They have a diverse range of products to help repair and maintain your flooring no matter what materials or styles. They have a whole team of chemists and technicians who work to develop new products and improve upon old formulas. Based in the U.K. WATCO operate internationally and have made a name for themselves as industry experts. 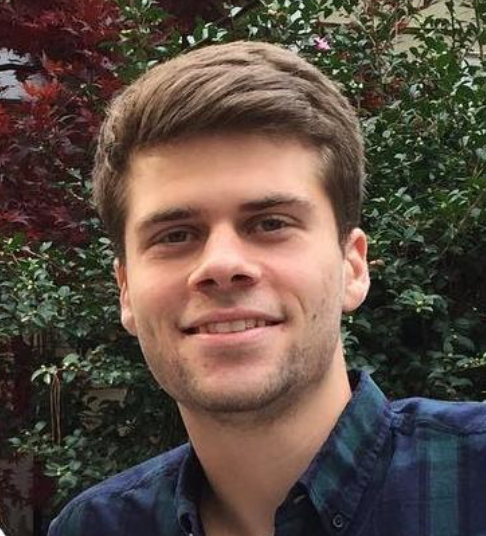 They work with big companies to individual contractors, priding themselves on delivering affordable value. WATCO believe in making their products simple to use, so even if you’re new to this type of home improvement you’ll be able to see the best results. Let’s see how their Teak Oil measures up. WATCO Teak Oil has been specially made to deal with thicker and more dense woods. This includes Teak, Mahogany and Rosewood. Other finishes won’t be able to give the same effect on these woods or will need regular coats applied. The Teak Oil is applied by brushing, spraying or wiping over the surface of the wood. The oil then penetrates the pores of the wood and covers the entirety of the hardwood. This allows for increased protection from the elements. Directions for use are provided on the product but it generally seems like a simple product to use. WATCO Teak Oil aims to emulate the hard finish done by professionals in the comfort of your home. It’s designed to give an effortless, easy finish which has a rich, warm colouring bringing out the natural texture of the wood. You can also use teak oil on Allen Roth flooring or any other hardwood flooring that doesn't have any laminate over it. The WATCO Finish offers protection from the elements, specifically moisture and sunlight. This helps prevent any staining and preserves the natural look and feel of the wood. Ultimately this leads to a longer lifespan of your flooring. I've heard people using this oil on outdoor decking like Azek Decks and they have had great success with it! The WATCO Teak Oil can be used on boats but only above the water line. It’s suitable for use by marine vessel owners. 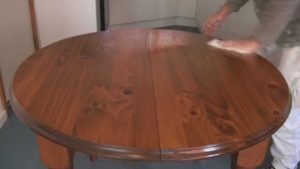 The Teak Oil can be applied by hand or sprayed, but most simply it can be brushed over the surface of the wood. This makes it simple to use even for those who haven’t done this before. I was very thankful of this easy application when I was refinishing my Cliqstudios cabinets, and the whole process was actually extremely easy, and they look brand new! The Teak Oil should be ready for use just one hour after application, though ensure it is all dried before setting foot on it and ruining the finish. The WATCO Teak Oil is available in pint, quart or gallon sizes so you only need to get the right amount for you with no waste. 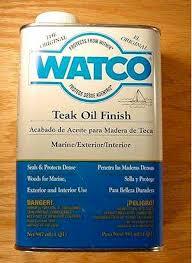 WATCO’s Teak Oil seems like one of the more versatile products on the market. It’s suitable for a range of products and materials which makes it ideal to a lot of different customers. Overall WATCO have done well to create a product that’s simple to use and protects your hardwood flooring. It has a number of uses and the formula seems effective at giving you more durable hardwood. “This is a good product to preserve the original color of teak furniture. Easy to apply.” - Dries M.
“I have used WATCO products over the years on tables and gun stocks. Several coats are needed and the more you put on the longer it takes to dry. 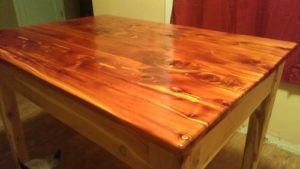 That being said, if you can handle it taking a little while to dry, it does it's job so other than that I have no complaints.” - Rob H.
There are isolated reports that the Teak Oil is pretty ineffective and that you need several coats to see results. This means an even longer drying time, which already seems to be longer than the 1 hour that’s advertised. Overall the feedback seems to be positive and people are pleased with the results of using the WATCO Teak Oil. The protection seems to last and it does what it’s meant to and despite the long drying times it’s providing value for your hardwood. WATCO have proven themselves to be finishing experts with the complex range of products. Each has been designed to tackle a specific problem and the WATCO Teak Oil is no different. The special formula works effectively on dense wood types and gives an all round protection and increased durability. Working from the inside, the WATCO Teak Oil seeps in through the pores on the wood. This gives the wood protection from the inside, meaning that the finish won’t chip or peel away. The product gives a hand finished look and complements the wood well. The downside to the Teak Oil is that is takes a long time to get to work and dry on, this means a lot of inconvenience. It’s pretty simple to use but users have complained that the instructions aren’t always clear. I've used this oil on my Costco hardwood flooring, and although it took a while and I had to do the floors section by section, it looks absolutely gorgeous! Overall the WATCO Teak Oil seems to be doing a solid job. It hasn’t done a lot to separate itself from competitors but it’s one of the more effective and long lasting oil finishes out there. WATCO Teak Oil is definitely one to consider for your hardwood. I hope you enjoyed this Watco Teak Oil review and you have learned a lot!